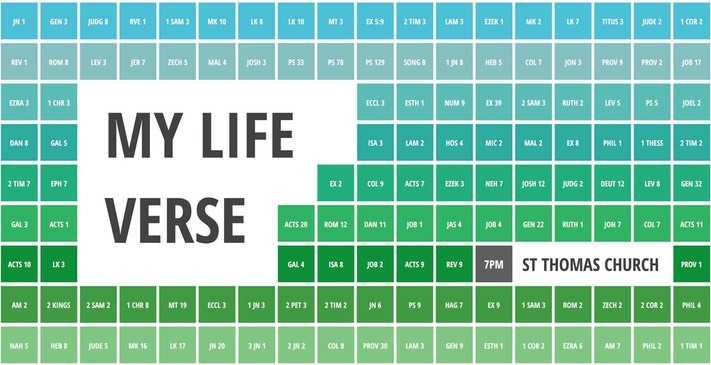 First of all, what is a ‘Life Verse’? Simply put, it’s a verse of scripture which ‘speaks' deeply to you - one which ‘sums up’ your spiritual life, or which reminds you of something of which you need reminding frequently! Some people go to quite some lengths to choose one. I think there are about 31,000 verses in the bible, so finding one which ‘suits’ could be like looking for the proverbial needle in a haystack. I imagine that it could be quite a task. I’m fortunate, in that mine was chosen for me, many, many, years ago. In those days, it wasn’t referred to as a ‘Life Verse’, but as a ‘Baptismal Promise’. Maybe some churches still call them that. Getting back in touch with Izzy reminded me of the circumstances of acquiring mine - though the verses themselves have never been far from me. This is a simple story of love, joy and blessing, which I have attempted to tell twice already this week, but have ended up binning each time because I made it far more complicated than it is. So let me try again - 'third time lucky', or some such. Once upon a time, I was young. Hard to believe now I know, but I was. And life wasn't particularly great. In fact, most of the time it was fairly horrid, with a few good bits in it (sort of like a really cheap hot cross bun - dry, tasteless and with nothing like enough juicy, fruity, bits). Into that life came a young lady, called Isobel. She was very, very, kind to me; gracious and loving. Anyway, to cut a very long story short, she was a Christian, and she was responsible, almost single-handedly, for my conversion to Christianity. She was, from my side at least, the best friend I'd ever had. We stayed in touch while we were students - writing letters, and seeing each other during university vacations; but we lost touch around the time I married Linda and she went off to Spain as a missionary.